I've a couple of cards on the Core'dinations blog today. This first one uses my Potted Garden stamp set from The Craft's Meow. I love getting inky with Core'dinations ColorCore cardstock. I used some of my favorite Kraft-Core cardstock from the Tim Holtz Nostalgic Collection from Core'dinations and embossed with an Anna Griffin embossing folder (Poppy). 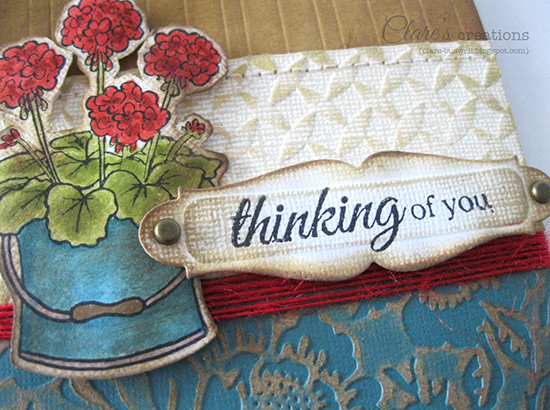 The sentiment from Potted Garden stamp set from The Craft's Meow I stamped onto a die-cut tag (Spellbinders Grommet tags). The flowers I colored using Distress Markers (Barn Door, Fired Brick, Crushed Olive, Tumbled Glass and Broken China) and everything is inked with Distress Inks (Antique Linen, Scattered Straw, Vintage Photo and Walnut Stain.) The pre-embossed cardstock is from the Core Impressions Jenni Bowlin Collection and Core Amour Sable Collection Rendezvous. 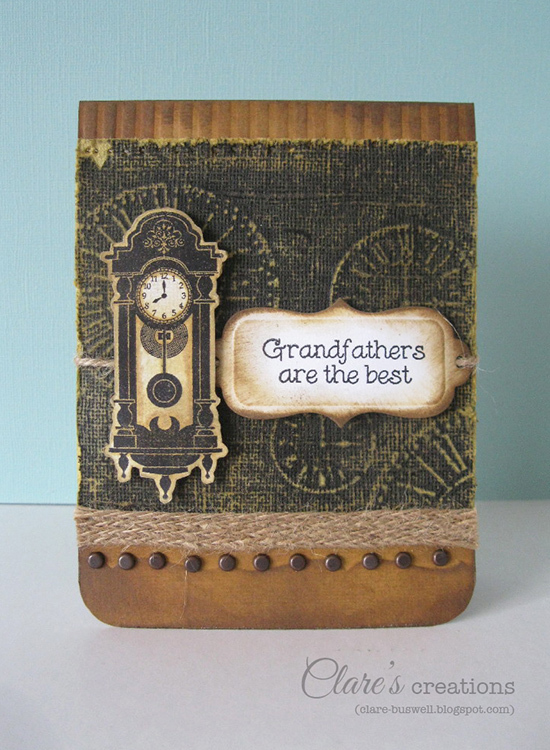 Next up is a more masculine card using one of my favorite stamp sets from The Craft's Meow - Vintage Clocks. For this card I used cardstock from Core Impressions My Mind's Eye, Core Impressions Graphic45 and Core Essentials Neutrals sanded using the Sand-It Gadget, all from Core'dinations. 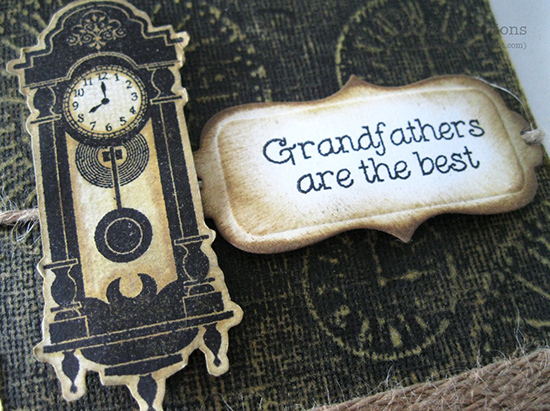 I stamped the Vintage Clocks from The Craft's Meow, did some fussy cutting and inked with Distress Inks Antique Linen and Scattered Straw. 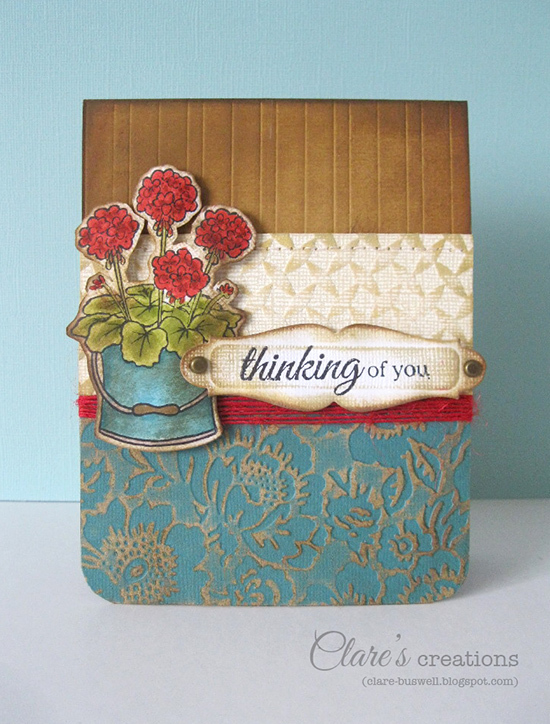 I love the texture the Core'dinations cardstock adds to the card. Ok, that's all for now, I'll be back tomorrow with my CASE Study card and another preview from the September release at The Craft's Meow. Such gorgeous cards! Love the way these cardstocks look when they are embossed and sanded. 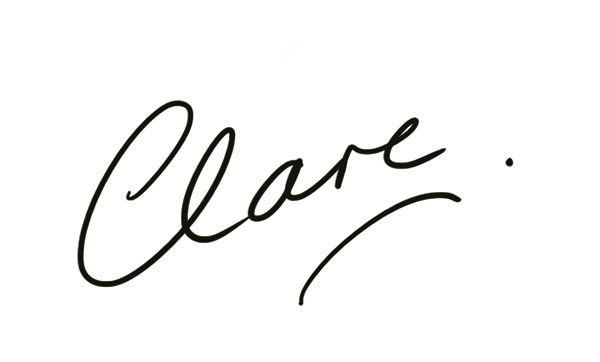 They give such a rich and elegant look! Core'dinations has some really lovely designs now! Love both your cards, but that first one is my fave!